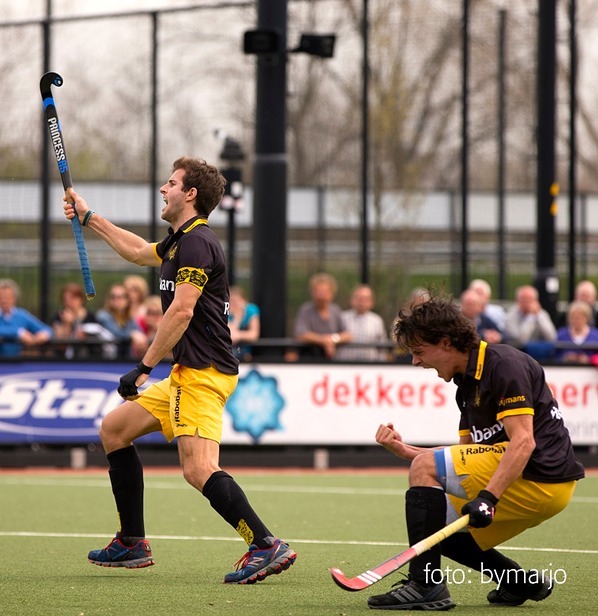 Playing hockey at the highest levels comes with immense highs, but sadly also immense lows. Two weekends ago, I experienced both of those emotions. Our league in Holland came to a breathtaking end; we had two chances to make a success of our season. A win on Friday night or a draw on Sunday would have kept us clear of the dreaded ‘play out’ zone and could have even catapulted us to a satisfying 7th place. The Hoofdklasse, arguably the best league in the world is made up of twelve teams, the team finishing last is immediately relegated with teams 11th and 10th playing against the 2nd and 3rd respectively from the league below for a place in the coming seasons Hoofdklasse. I’ve experienced these types of pressure games many times before in my career as a national player for South Africa. We have played numerous one-off games to see who will qualify for the Olympic Games or World Cup. In these types of games you either handle the pressure or it handles you. I had accepted that as captain and drag-flicker (the player expected to flick the ball at penalty corners) of our club team, I would be under increased scrutiny over the weekend’s games. When faced with these types of games, I think it’s important to prepare mentally in advance for the feelings that you are going to be faced with on game day. You can’t trick yourself into thinking that this game isn’t different to all the others, but you can control how you respond to the situation. Our scenario meant that the wrong set of results would see us through to the play outs, resulting in a chance to be relegated. To me, though, feeling pressure shows that you care about the outcome of the game or the scenario you find yourself in. In hockey, pressure may come in physical forms on the field in terms of the opposition’s playing style but more commonly it is only an illusion, which we manufacture in our minds. I have had moments in the past when pressure has actually had a physical impact on my game and perhaps it happened again on Sunday. Your body’s muscles actually become so tense that you essentially can’t perform your skills to your regular standard. Perhaps this is the reason for my final flick on Sunday. On Sunday, we needed a draw to secure our place in next year’s Hoofdklasse. A loss meant we would have to play additional matches to prove we deserved to remain in the top tier. I had already scored twice in the match to level the scoring at 1-1 and 2-2. Once again we went a goal behind and with three minutes left in the match, I had a final corner to put us level again. I had picked out the spot in my mind where I wanted the ball to go and despite sending the keeper completely the wrong way, I pushed it just wide of the post. We lost the match 3-2 and for the past week-and-a-half I have gone to bed with the image of that ball hitting the boarding behind the goals. Sure, other guys had chances in the match to level the scoring or even to put us ahead, but I can only control what I do, and that’s what I was struggling with. I had the chance to save us. So what’s changed this week? I’m now going to bed with a different image in my head. I’m picturing the next game and the coming World Cup. Instead of that ball going wide, now it’s a goal. I’m back at training so my muscles know how to ‘act’ when that moment arises the next time. What happened has happened and I know it hurt more people than just myself. All I can do now is prepare for the next moment when I have such an exciting opportunity – and get that one right.